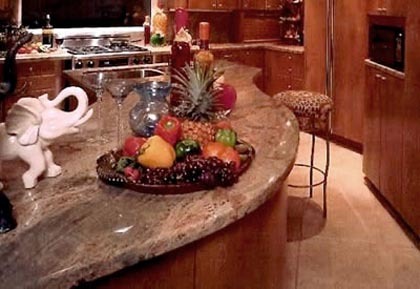 Granite countertops require special care so that they continue looking beautiful for many years. Although granite is quite resistant to scratches, to properly maintain this type of countertop material, it’s advisable to follow a few simple procedures. Spills have a tendency to soak into the surface, so to avoid deep staining wipe up spills immediately. For stone surfaces a neutral cleaner, such as stone soap or mild dishwashing liquid and warm water, is safe to use. When cleaning with a soap solution, use a soft, clean cloth and then rinse the surface thoroughly. Finish off by drying with a soft, clean cloth. If you do happen to stain the surface, removal depends on the type of stain. First, try removing it with this paste: mix together a cup of flour, 1-2 tablespoons of dishwashing liquid, and water. Place the paste over the stain, cover in plastic wrap, and leave overnight. In the morning, use a wooden utensil to scrape away the paste and give it a rinse. This should work except for stains made from grease, oil, or milk. In these cases, instead of dishwashing liquid use hydrogen peroxide in the paste, or ammonia. For organic stains resulting from coffee, tea, or fruit, a mixture of 12% hydrogen peroxide combined with a few drops of ammonia should work wonders.